​Here's one corner of the house that doesn't get enough consideration. But what a difference i​t can make in transforming your bathroom. 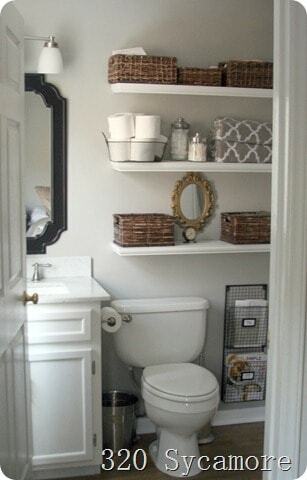 There's 2 trains of thought here: either you want to decorate the bathroom and fill that void above the toilet, OR you need to utilize that storage space to gain some sanity back into that room. 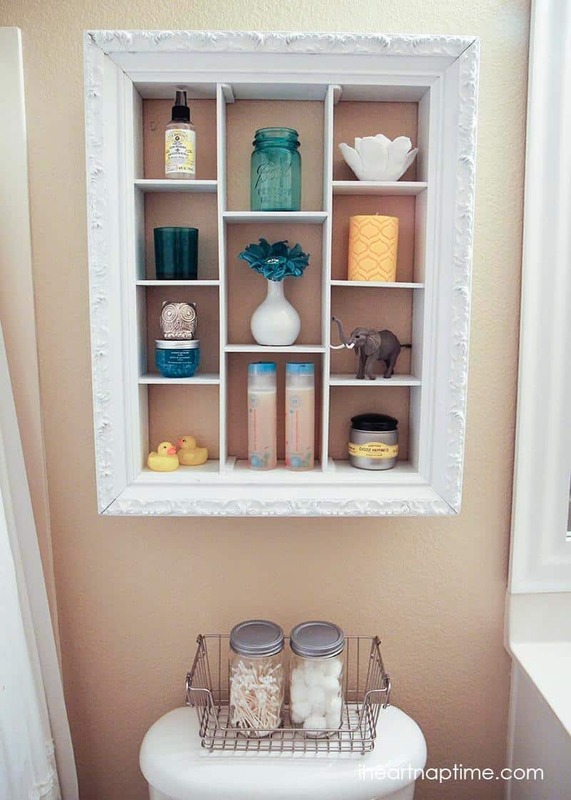 So we'll cover both instances... Beautifying the bathroom, or ​building some ​storage hacks (while also making it look beautiful at the same time). ​And if you just need some creative toilet paper holders, we got some of those too. 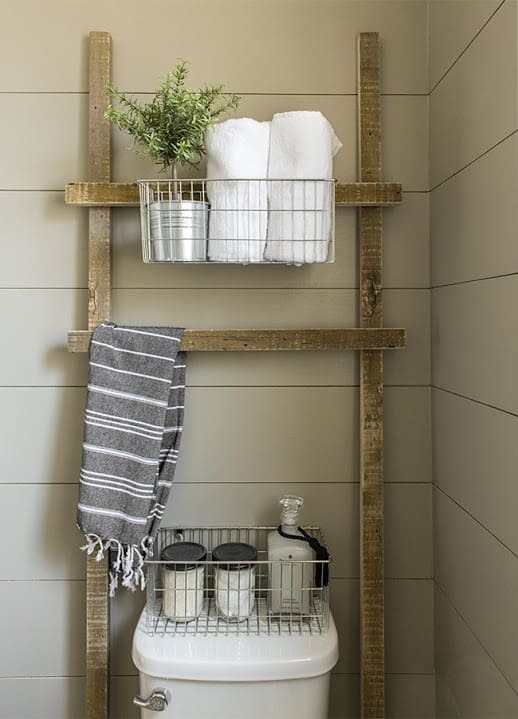 ​Who doesn't love a little rustic shelving? If that's your jam then look no further. They're sturdy and allow for easy access to towels and all other bathroom essentials. The pipes are threaded fittings you can find in the plumbing section at any hardware store, and is super easy to put together. ​This unique piece is a few pieces of reclaimed wood, and built into a sort of ladder/shelf. 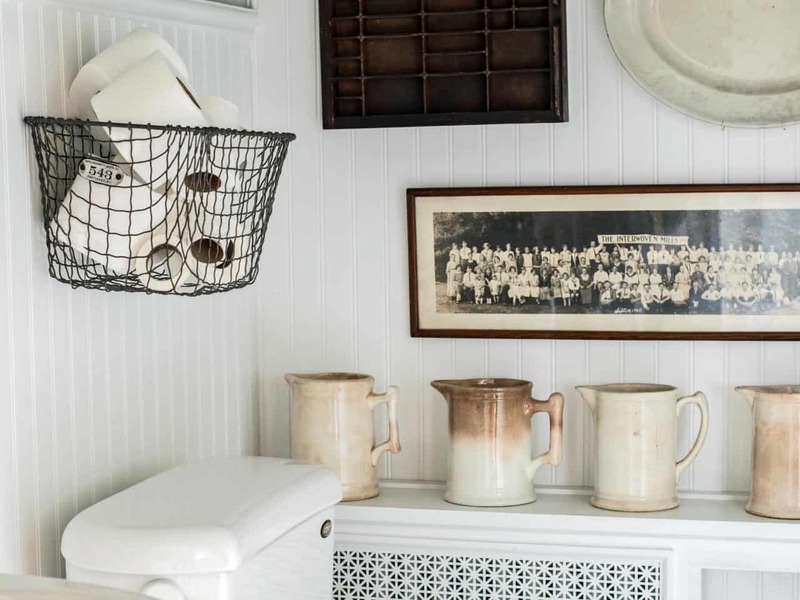 You can see they cleverly used a basket with hooks to act as storage, and they can use the middle bar for towels. Unfortunately, there are no detailed build instructions, but it's still quite a simple build - just make sure it's sturdy and ​pinned to the wall. ​Again, there is no build instructions here - just some pictures to get your imagination going. 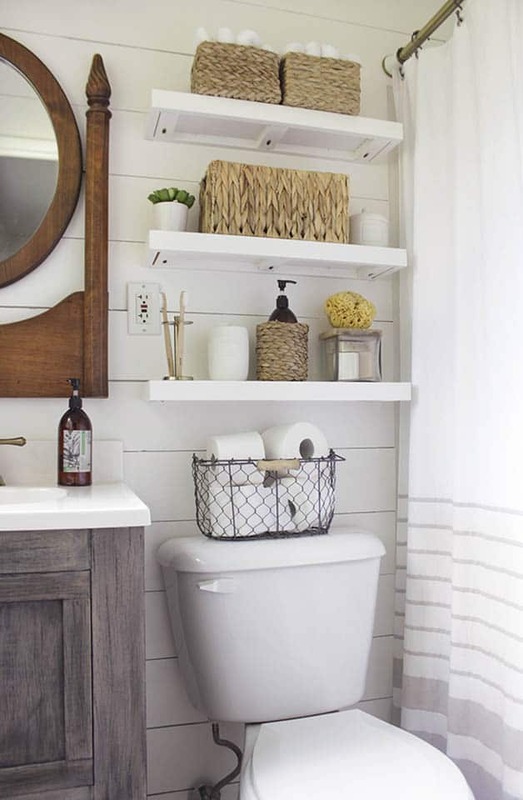 But the clever use of shelves and baskets should give you a few ideas on how to match the theme of your own bathroom upgrade. ​4. 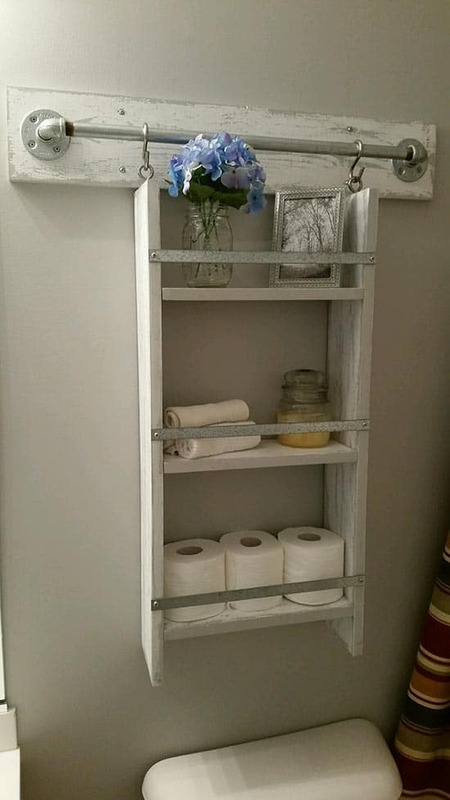 How to make a Hanging Bathroom Shelf for only $10! ​I think this one checks off all the requirements for a great little bathroom project. It's rustic, beautiful, useful, and easy. Oh, and it's cheap. And thankfully, Shanty2chic has provided all the instructions needed to build this. 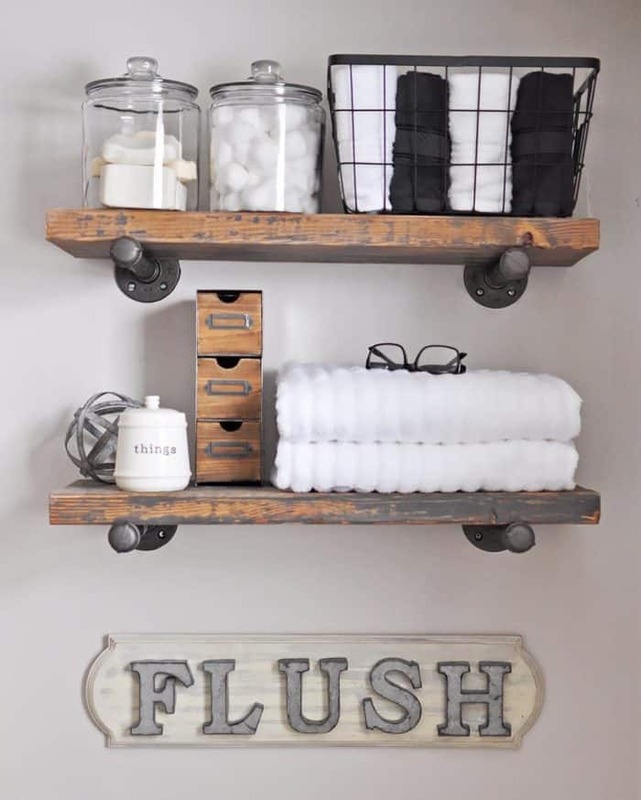 ​Here's another simple - yet very effective - method of cleaning up your bathroom space and keeping a very modern or rustic look. 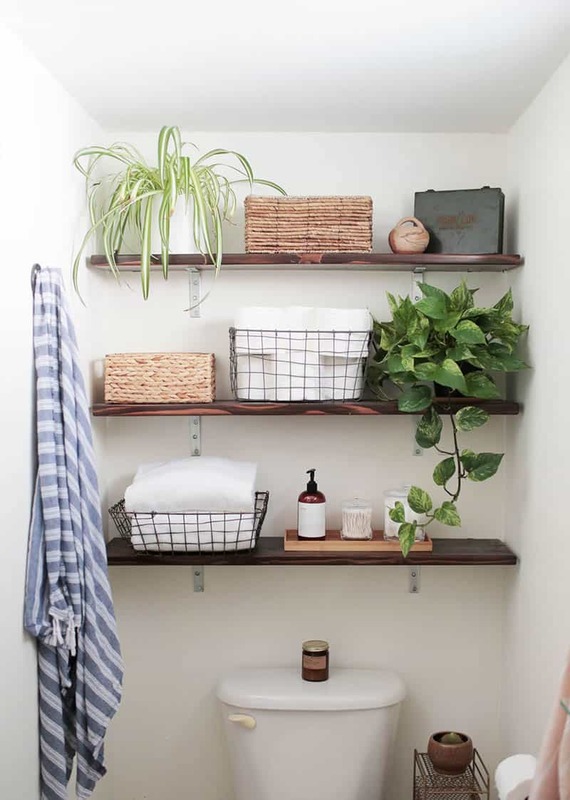 They simply use floating shelves with a satin finish to give it a nice shine. It may look intimidating at first, but this one is quite easy. 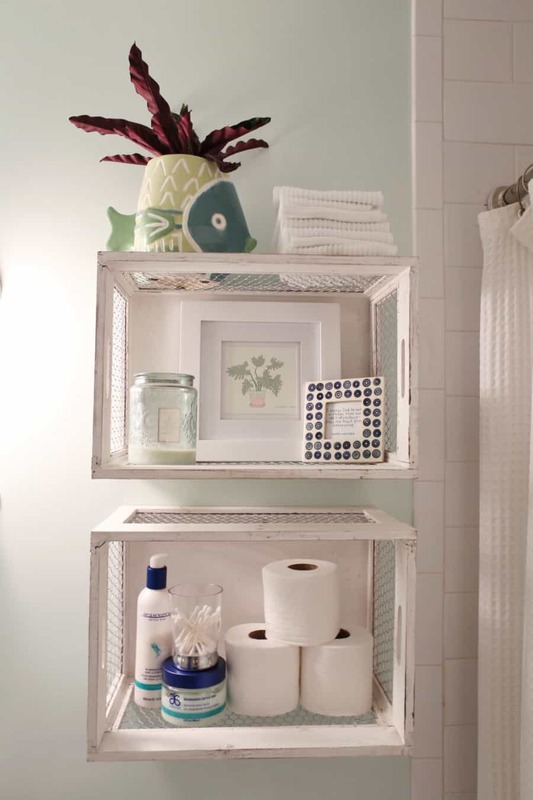 Just seek out some old crates, and pin the bottom of the create directly to the wall. 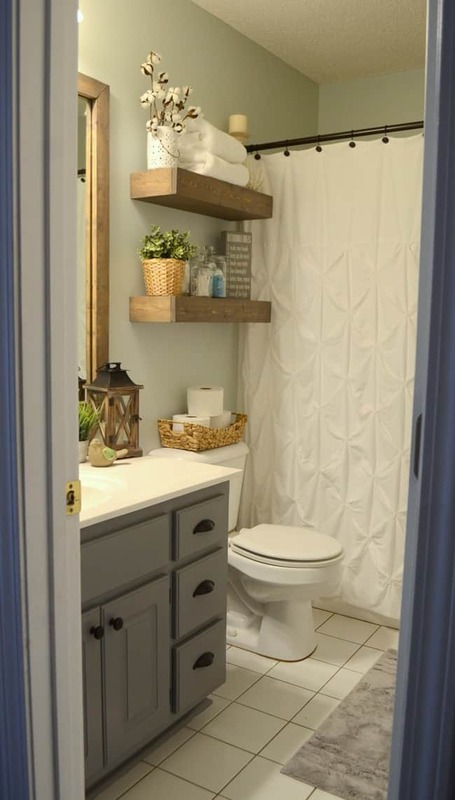 For bonus points, give it a weathered paint job to match your bathroom or theme (like this did above). ​This shelf was created using some old fence wood, nails, and some walnut stain. Then some twine for hanging photos (if that's what you're going for). The result: a very charming little station for photos or storage. ​Recycling at it's finest - take a close look at the sides (yes, those are old shutters). 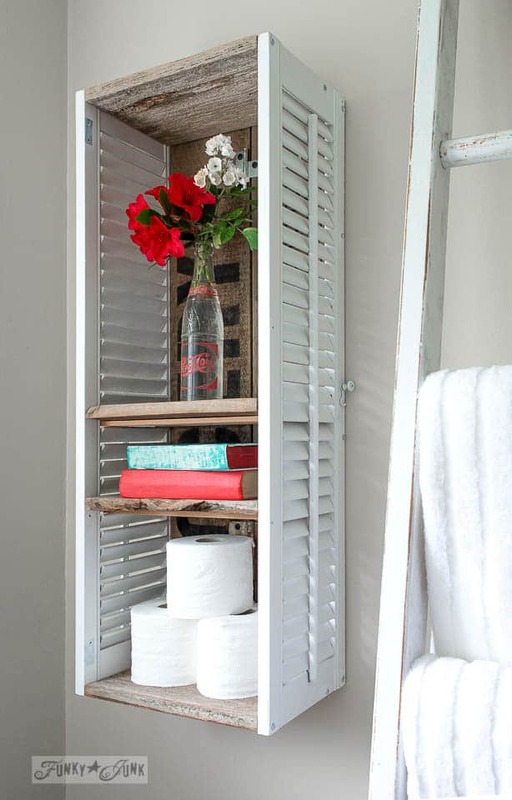 Even if you don't have any old shutters hanging around, it gives you a good idea on how you can use almost anything to create a cool storage space. ​Hey there sailor! 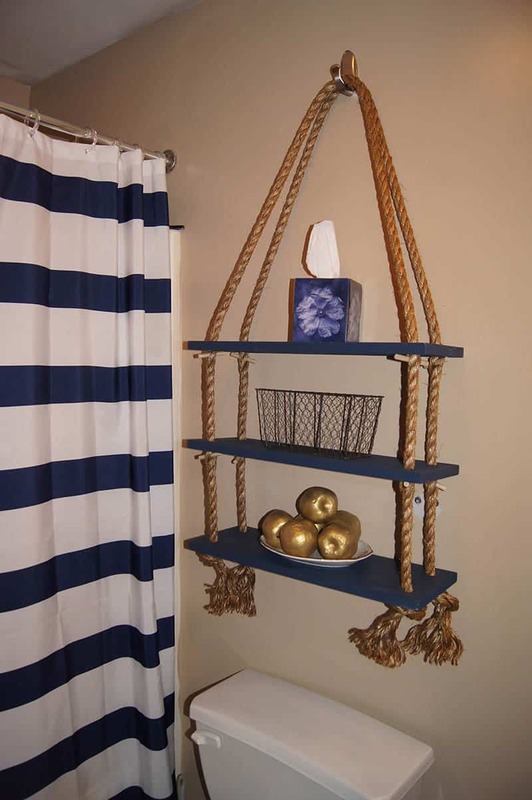 The gold ropes, navy blue paint, and shower curtain together give this a very oceanic ​theme. Rope shelves are a very cool and unique storage solution, but it take a little bit of careful balancing. ​You never know what you'll find at a garage sale, like Jamielyn found this frame and it sat in her garage for a few years. All it needed was a coat of spray paint. Just goes to show that you don't always have to build, sometimes it's more just finding the right thing to "upcycle". ​Baskets, baskets everywhere. And so accessible too. 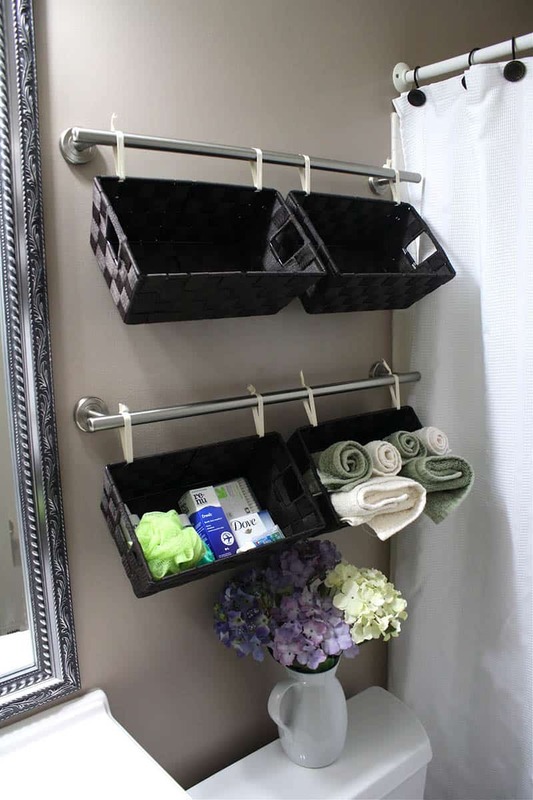 If you have time to pick up a few cheap baskets from the dollar store, and hang a towel rack, then you are in the basket business. ​This is hilarious and awesome. 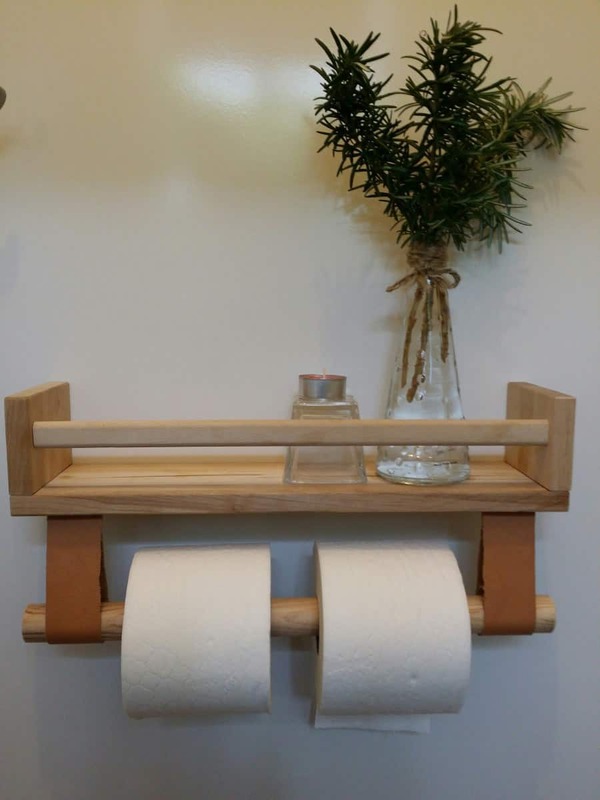 It's an ikea spice rack, with some straps for toilet paper. There's not really much else to stay here. ​I really love simple ideas like this. Like just pinning a basket to the wall. It looks cool and rustic, and it's useful. Not to mention, it will take you all of 5 minutes to put up. 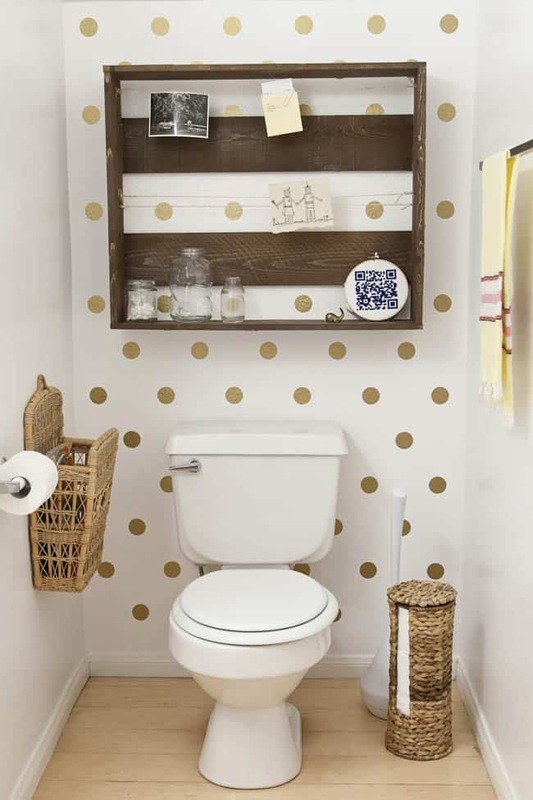 ​Here's another full bathroom makeover filled with ideas to get your creative juices going. In this case it's just some simple walnut shelves. It's not over the top, but it's very useful and has tons of storage. ​More rope shelves! I can't get enough of these. But this one just matches the theme of the bathroom so well I had to include it. ​And another industrial pipe shelf. What I love is the thought that went into the details, including the ​weathered "flush" sign underneath. ​This is what I call being super creative. 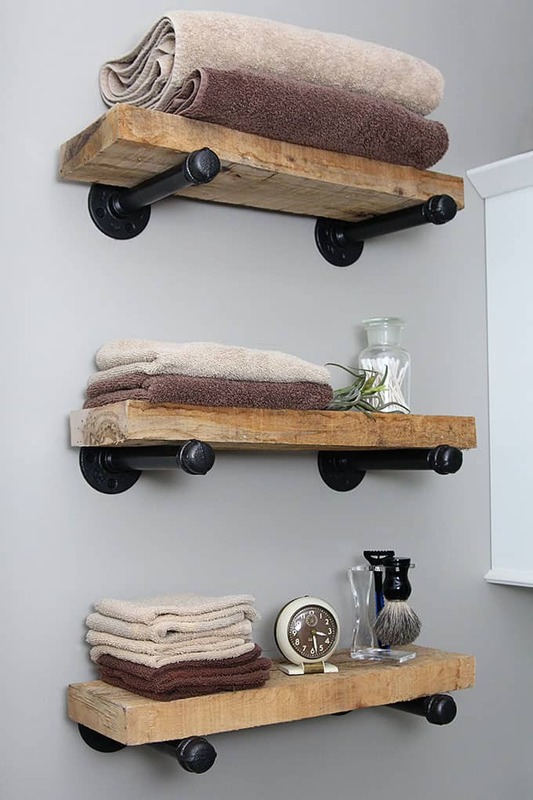 Hanging a shelf on plumbers pipes to give it an industrial look. And the weathered white/grey paint just adds perfection. 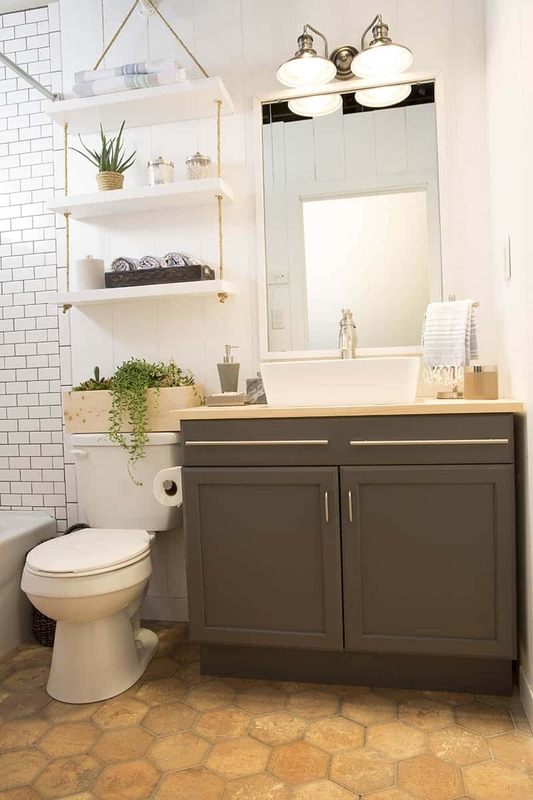 ​Here's another full bathroom makeover, and over the toilet you'll notice some beautiful stained floating shelves. The decor on the shelves really brings the whole thing together. And of course, the dark walnut stain.